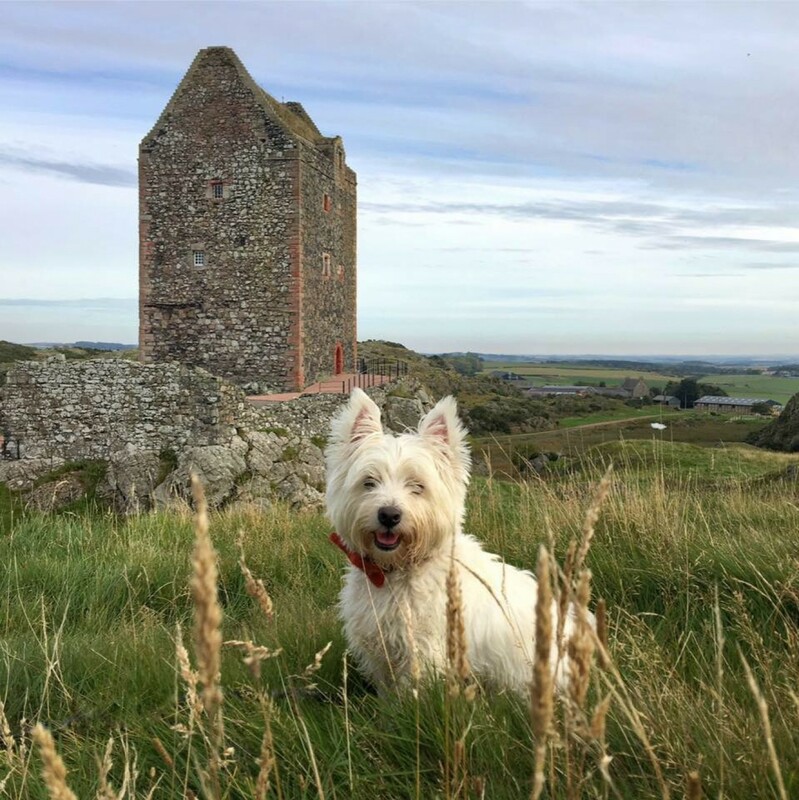 We recently enjoyed a weekend break in Mr G’s Highland hometown of Nairn. Nairn is a seaside town with beautiful beaches. It’s home to Tilda Swinton, and no other than Brad Pitt has been spotted in town. It’s a great base for exploring the NC500, The Black Isle, Moray and beyond. Nearby are my old favourites Culloden Battlefield and that pilgrimage site for Outlander fans, Clava Cairns. We headed straight to see them as soon as we arrived. I had my own handsome Highlander in tow so I didn’t bother touching the split standing stone at Clava Cairns to conjur up Jamie Fraser! To be honest, having studied Scottish history at university the last place I’d want to be transported back to would be a stone throw from Culloden battlefield in the early 1740s. Mr G’s doesn’t share my passion for standing stones and ancient burial cairns. I see a fascinating insight into the lives of my ancestors, he sees a pile of old stones. We’d decided to venture north to drive some of the NC500 during this trip. On day two of our trip, we were up with the larks, fed and heading towards the Kessock Bridge while it was still dark. Later as we crossed the Dornoch Firth Bridge, day was dawning. Weirdly, if we looked one way we could see the sun rising, and the other way we could see a pretty rainbow against a mountain backdrop. We looked for somewhere to stop and luckily found an idylic spot on the exclusive Carnegie Links Golf Course, which is part of the Skibo Castle estate. I gazed in wonder at the beautiful sunrise and colourful rainbow over a field of gold. It’s amazing how happy a scene can make you feel. Mr G waxed lyrical about the glorious, fabulous, wonderful green, greens of the Carnegie links! Our destination for the day was Golspie, home of the stunning Dunrobin Castle and a huge hilltop statue of that historical arch villain, the Duke of Sutherland. Sutherland is remembered for the ruthless means he adopted to clear his land of people to make way for sheep and deer. He’s undoubtedly the most detested character of the Highland Clearances. After visiting the castle we’d planned to climb Ben Bhraggie to see the giant statue of the Duke of Sutherland on the summit. That morning I’d discovered that Carn Liath Broch was a mere stone throw further north. It’d be such a shame to miss it, I hinted hopefully. Being a good egg Mr G agreed to visit the broch. What’s not to love about Iron Age houses?! It turned out to be a beautiful site with panoramic views along the coast and back towards Dunrobin Castle, which could be seen peeping through the trees in the distance. We could even see the arch villain Sutherland looming on top of Ben Bhraggie. Originally, the broch would have resembled a tall upside down bucket. At 2,300-years-old I’d love to hear the stories that its walls could tell. There was still a small guard room inside, and best of all a staircase which could still be climbed. I was beside myself with excitement – a room AND stairs to explore! After exploring every last nook and cranie in the broch, we decided we were happy sightseeing so shelved our plans to climb Ben Bhraggie. We decided to stay on the NC500 and head further north to Brora. It had turned out to be a beautiful day, and the coastline looked spectacular under a lovely blue sky. It’s no surprise that this route is part of Scotland’s answer to Route 66 – the NC500 or North Coast 500. A 500 mile loop around the north of Scotland, which takes in some of the most stunning scenery the country has to offer. After Brora Mr G suggested we drive a wee bit further north. It was such a gorgeous day and being on the NC500 with not a care in the World it seemed crazy not to push on northwards. On to Helmsdale with its touching tribute “The Emigrants” – a statue dedicated to the Scots forced to leave their land as a result of the Highland Clearances, and also to the ones who simply left in search of a better life. It has a twin statue in Canada where many Scots ended up. Beyond Helmsdale we came to a fabulous hairpin bend. We watched as two articulated lorries navigated it, heading towards each other. It looked hair-raising and I was glad we were in a car. On we drove. The land was beautiful. The mountains made way for wide open plains, sea stacks and clifftop castle ruins. The place names started to sound more Norse than Scottish – Ulbster, Lybster, Nybster. I noticed Mr G shoot me a quick, shifty glance. It was one of those, I hope she didn’t manage to read that road sign type of glances, but he was out of luck. The Hill O’ Many Stanes is Somewhere I’d read about before and become obsessed with. I’d added it to my long list of places to visit then forgotten all about it. I couldn’t have been more excited to find myself suddenly and unexpectedly there. Off we went to visit yet another ancient historical site or pile of old stones as Mr G might describe it. 4,000 years ago it must have been a very significant place. To painstakingly place so many stones in neat rows would have taken some effort. 200 survive today, but it’s thought there could once have been as many as 600. The purpose of the site has been long lost in time. I absolutely loved it, and it quickly became one of my favourite historical sites in Scotland. Mr G looked less than impressed by the many stanes all around him. He quickly cheered up when we left the site and bumped into a couple with six Westies. Our poor Wee Dug had been banned from this trip, as it was to be a dug free birthday treat for his dad. His dad is a spoilsport at times but at least we’d got our Westie fix for the day. And on, and on, and on until …….. we arrived in John O’Groats just in time for lunch! Our planned NC500 jaunt to Golspie, a mere 64 miles from Nairn had ended up with us driving 133 miles for lunch. Give us an open road and we cannot be trusted to make sensible decisions when it comes to road trips. We enjoyed a really tasty lunch at The Storehouse in John O’Groats right next to the iconic sign post. It’s not every day you can sit at a panoramic window eating lunch and enjoying clear views of Orkney. I’ve heard people slate John O’Groats, saying there’s nothing there. Nothing, but stunning scenery and great views. It didn’t disappoint me and was well worth the 266 mile round trip to visit. That evening we toasted a great day out at the Classroom Bistro in Nairn. Chilled champagne, delicious food, good friends and a cheeky wee cocktail or two – perfect. I hope you’ve enjoyed your jaunt with me on the NC500 for a whistle-stop tour of Sutherland and Caithness. planning an NC500 road trip and want to what the west looks like too? Here’s a blog featuring the most iconic (and hair raising) stretch of road on the route! Just drove the NC500 and saw a Wee White Dog taking the ferry off Orkney May 2cd. I was so pleased because he gave me some sweet licks! My wee white boy is back in St Louis, Mo where I live and of course, I miss him terribly. Scotland is enchanting and I am so pleased to have seen such a great deal of it on this trip. Best to you and your little guy. Just found my way here by way of True Highland’s Facebook page. I love your writing style and those photos are beautiful. It was interesting to read about the places I’ve passed by on the way to Reay where I now live but other than John o’Groats I’ve never stopped at any of them! You’ve made me want to. Casper is gorgeous. We are owned by two wee white dugs-they’re great wee characters! So enjoying your Scottish road trips Sam. One day I will make it over there to see them in person. And yay for dugs! XD I have two black ones. One wee and one… not so much.